Radial Electrolytic Capacitor 16x32mm 105°C. Radial Electrolytic Capacitor high quality, low impedance (low esr) PC Miniature 21x13mm 105°C. 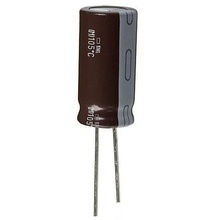 Radial Electrolytic Capacitor high quality, low impedance (low esr) PC Miniature 31x12mm 105°C. Radial Electrolytic Capacitor 18x45mm 105°C. Radial Electrolytic Capacitor 13x25mm 105°C.